Cross the Mississippi River for beer, ribs, blues, a massive park and the world's biggest underpants. 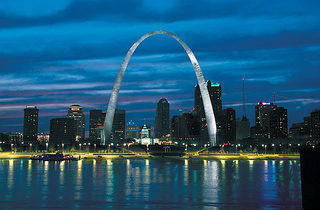 Chicagoans can’t really be blamed for avoiding St. Louis. Whether it’s the ever-present Cubs-Cardinals rivalry, the 1998 Mark McGwire–Sammy Sosa home-run challenge or the 1904 disaster when St. Louis stole the Olympics host-city rights from Chicago, the Gateway City always seems to win at our expense, so it’s hard not to sulk. But there are plenty of good reasons to get over the bitterness and cross the I-55 enemy line. 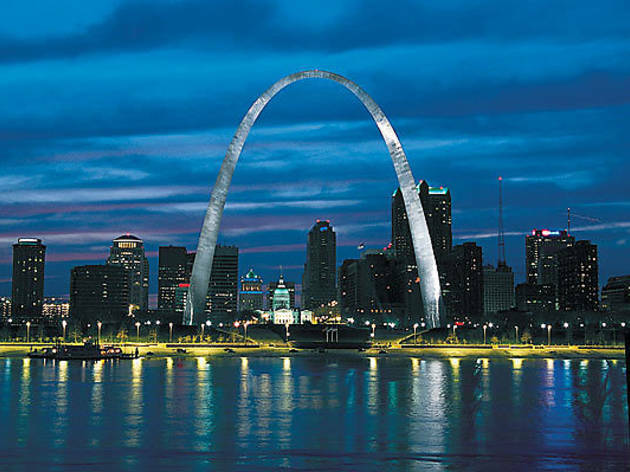 The first is Eero Saarinen and Hannskarl Bandel’s awe-worthy Gateway Arch (707 N First St, 877-982-1410, $10), a 630-foot structure with 30-mile views across the Mississippi River. While there, you can also arrange for helicopter ($29) and riverboat ($12) sightseeing jaunts. St. Louis’s second-most iconic attraction also draws in tourists: the Anheuser-Busch Brewery (12th and Lynch Streets, 314-577-2626), which offers free tours with beer samples and a $25 “Beermaster” behind-the-scenes look into the historic brewhouse, finishing cellars, Clydesdale stables and more. A few blocks away stands the creepy but excellent Laclede’s Landing Wax Museum (720 N 2nd St, 314-241-1155, $4), with 160 life-size celebrity tableaux including Johnny Cash, Jesus, Freddy Krueger, Lon Chaney and the waxworks queen herself, Madame Tussaud. Next up is City Museum (701 N 15th St, 314-231-CITY, $10–$12), a privately owned marvel featuring an aquarium; a working shoelace factory; interactive art and glassblowing studios; a carnival fun house; mammoth, all-ages playgrounds constructed from found objecats including cupolas, bridges and abandoned airplanes; and, uh, the world’s largest pair of men’s briefs. Tired yet? Drop your bags at the four-story Victorian Lemp Mansion bed and breakfast (3322 DeMenil Pl, 314-664-8024, rates start at $115, which includes a buffet breakfast), the purportedly haunted former residence of America’s first lager brewers, four of whom committed suicide on the premises. The staff goes home at night, so you can ghost hunt without interruption. Around the corner is The Stable (1821 Cherokee St, 314-771-8500), a microbrewery/pizzeria housed in the old Lemp stables that offers homemade brews (including a Lemp lager) and rare beers and promises never to sell anything “Lite.” It’s also St. Louis’s first microdistillery—it handcrafts small batches of absinthe, moonshine and other spirits. After a few slices, wander down Cherokee Antique Row to Saxquest (2114 Cherokee St, 314-664-1234), a store and free museum dedicated to vintage saxophones, and check out the vintage Brooke Shields doll at the three-story, secondhand Retro 101 (2303 Cherokee St, 314-762-9722). Next, browse hard-to-find vinyl and CD selections and electronic instruments including theremins and sonic nauseators at APop Records (2831 Cherokee St, 314-664-6575), an independent store, record label, live music venue and custom-welding shop—they won’t fix your overheating radiator, but they will make you a metal sculpture. Then, head over to the South Grand district for stops at TFA The Future Antiques (3201 S Grand Blvd, 314-865-1552), where you can give your pad an Austin Powers makeover with princess phones or kooky 1960s wall clocks and lamps, and Cheaptrx (3211 S Grand Blvd, 314-664-4011), a queer-owned gift, costume and adult-toy store and tattoo and piercing salon. Grab a bite at Mangia Italiano (3145 S Grand Blvd, 314-664-8585), which features daily homemade ravioli ($13) and live blues, jazz, bluegrass and punk shows. Other popular spots to nosh (and tip one back) include the courtyard patios at Royale (3132 S Kingshighway Blvd, 314-772-3600), where the Kobe beef burger ($10) and Boozy-Q (an Irish-cream soaked devil’s food cakewich with Chambord cream, $6) rule, and the mosaic be-muraled Broadway Oyster Bar (736 Broadway, 314-621-8811), where catfish with red beans and rice sets you back $9, sweet potato–pecan pie costs $5 and live blues shows take the stage every night. A visit to Missouri isn’t complete without digging into some barbecue. Roper’s Ribs (6929 W Florissant Ave, 314-381-6200) is a mostly takeout joint with four tables, where owner Carl Roper smokes and then grills his baby backs ($10 per half-slab) in-house. Another standout is the snoots ($8), which are not snouts, but deep-fried pig cheeks with homemade barbecue sauce. Walk off that meal at Forest Park (Lindell and Kingshighway Boulevards), which is 500 acres larger than New York’s Central Park and boasts a zoo, history museum, science center, gardens, lakes, outdoor opera and the free Saint Louis Art Museum (314-721-0072). Don’t miss “Bare Witness: Photographs by Gordon Parks” (through August 3), a retrospective of 50 stunning images by Life Magazine’s first African-American photojournalist. Ready to crash but nervous about potential ghost sightings at the Lemp Mansion? Try the Cheshire Lodge (6300 Clayton Rd, 800-325-7378, rates start at $89), an olde-England-type inn with fireplaces and club chairs in the lobby, themed suites and a parking lot geared for driving on the left. It has just installed a lovely swimming pool, so you can lie back, relax and let your old resentments against the Cardinals—and St. Louis—float away.